Meiji Shrine or Meiji Jingu(in Japanese) is a Shinto shrine dedicated to Emperor Meiji and his wife. As part of Tokyo city tour, we visited this place after visiting Tokyo Tower. Barrels of Sake : When you enter the premises of Meiji shrine, you notice barrels of sake wrapped in straw stacked up near the entrance. Made from fermented rice, Sake is a Japanese alcoholic beverage. To know more about these barrels, read the following text which was written on information board put up near these barrels - "During the Meiji Era, Emperor Meiji, whose divine soul is enshrined here at Meiji Jingu, led the industrial growth and modernization of Japan by encouraging various industries and supporting technological development. Due to their grace and virtue, Emperor Meiji and his consort, Empress Shoken, the beloved mother of our nation whose soul is also enshrined here, are held in the highest esteem by the Japanese people. These sake barrels are offered every year to the enshrined deities by members of the Meiji Jingu Zenkoku Shuzo Keishinkai (Meiji Jingu Nationwide Sake Brewers Association) including the Kotokai, which has made offerings of sake for generations, as well as other sake brewers around Japan wishing to show their deep respect for the souls of Emperor Meiji and Empress Shoken. In addition to stating our humble gratitude to all of the brewers who have so graciously donated their sake, we also pray for the continuous prosperity of the sake brewing industry and all the other industries maintaining Japan's traditional culture." Barrels of wine : If you find barrels of sake on the right side when you enter, you will find barrels of wine on the right side. What is this about? To find read the following paragraphs from the information board - "The Meiji period was an enlightened period during which a policy of "Japanese spirit and Western Knowledge" was adopted, to learn from best of Western culture and civilization while keeping Japan's age-old spirit and revered traditions. Emperor Meiji led the way in promoting modernization by embracing many features of western culture in his personal life such as shearing his topknot and donning western attire, and in many other aspects of daily living. Among these departures, His Majesty set an example by taking western food and in particular by enjoying wine with it. The barrels of wine to be consecrated at Meiji Jingu have been offered by the celebrated wineries of Bourgogne in France on the initiative of Mr. Yasuhiko Sata, Representative, House of Burgundy in Tokyo, Honorary citizen of Bourgogne and owner of the Chateau de Chailly Hotel-Golf. Profound gratitude is due to the wine makers who have so generously contributed to this gift to be consecrated here to the spirit of world peace and amity, with the earnest prayer that France and Japan will enjoy many more fruitful years of friendship"
Etiquette / Rituals : As a mark of respect following etiquette are observed at the shrine. At the shrine archway(Torii), one needs to bow once while entering and once while leaving. Before entering the shrine you need to follow the rinsing ritual near the water font(Temizuya). Using the wooden dipper, rinse your left hand and then right. Pour water into your left hand and rinse your mouth. Again, rinse your left hand and rinse the dipper. 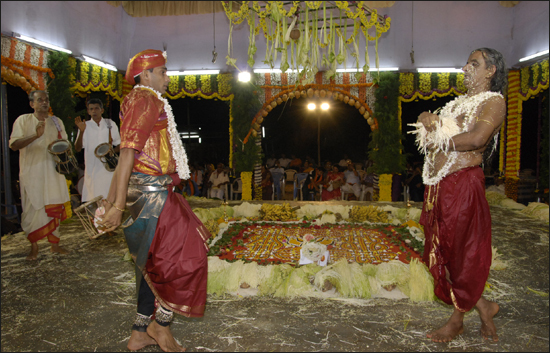 Seeing and following these rituals, I found similarities with the Dharmic religious rites in India. The Main Shrine : The main shrine at Meiji Jingu does not have any images or idols typical of Shinto religion. Here, one can drop coins in the offertory box kept. To offer your prayers at the main shrine, one needs to follow the following etiquette - at first, bow twice and clap with your hands twice. Then, make a wish and bow once again. Offerings and Wish Tablet : Near the main shrine is the camphor tree around which wish tablets are hanged. Visitors can write their wishes on the wooden tablet (called Ema) and hang it on the hooks provided around the tree. One can write their wish in any language. Marriage Ceremony : When we visited the Meiji shrine, we witnessed a Shinto wedding procession which was led by two priests and two shrine maidens, followed by the couple under a red umbrella and the family and friends. It was delightful seeing the colorful ceremony in wonderful surroundings. Forest at Meiji Shrine : It is amazing seeing the premises of Meiji Shrine full of greenery. More so, because you find the forest right in the middle of a highly modern and most populous city in the world. The trees here are planted by hand about 90 years ago consists of many endangered plants and animals. This further thrusts the importance of human will and effort in recreating the lost Edens eleswhere in the world!